Russia’s decision to allow troops to be sent to Ukraine is meant to deter radicals from using violence in the country and to facilitate reconciliation, said Russian Foreign Minister Sergey Lavrov. He dismissed the interpretation of the move by Western powers as an act of aggression on the part of Moscow and called on the West to stop using human rights as a pretext for pursuing geopolitical goals. 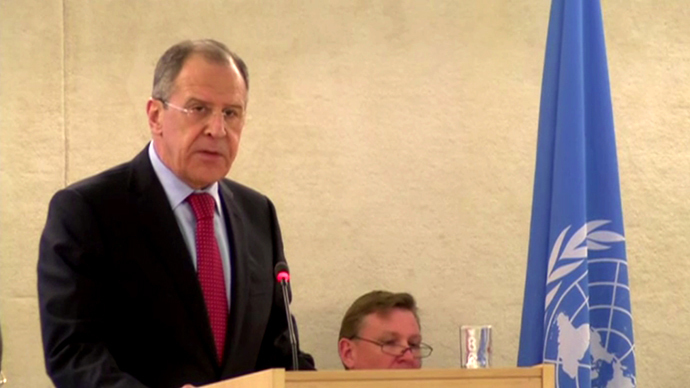 “I reiterate, we are talking here about protection of our citizens and compatriots, about protection of the most fundamental of the human rights – the right to live, and nothing more,” Lavrov told on Tuesday the UN Council on Human Rights in Geneva. “Those who try to interpret the situation as an act of aggression, threaten us with sanctions and boycotts, are the same partners who have been consistently and vigorously encouraging the political powers close to them to declare ultimatums and renounce dialogue, to ignore the concerns of the south and east of Ukraine and consequently to the polarization of the Ukrainian society,” the minister charged. Lavrov suggested that Russia would not use its military force for geopolitical gains under a pretext of protecting human rights. Lavrov said Russia’s position on the Ukrainian debacle is that the self-proclaimed government in Kiev must comply with its obligations under an agreement, signed on February 21 by President Yanukovich, opposition leaders and foreign ministers of Germany, France and Poland. Yanukovich held his end of the bargain, but the opposition didn’t, the FM stressed. “The opposition did nothing. The illegal arms have not been relinquished, the government buildings and streets of Kiev have not been completely freed, radicals maintain control of cities. Instead of a promised national unity government a ‘government of the victors’ has been created,” he said. Lavrov called on Kiev to return to the February 21 agreement and conduct a constitutional reform, which would include participants from all regions of Ukraine. The reform should be approved in a nationwide referendum, he said. Following the ousting of Viktor Yanukovich in a wave of violent street protest, the opposition-controlled parliament appointed a new government. Ten Ukrainian regions saw massive protest rallies against the developments in the capital. Several of them, including Crimea, announced that they would not take orders from the new government and replaced appointed governors with elected representatives. Moscow reserved the option to send troops to Ukraine, if it were required to protect civilians in the defiant regions. Kiev called the move “a declaration of war” and announced military mobilization. The US threatened Russia with political and economic isolation.